Thank Ashley for this one. Although I was already working on JOY when she asked for it, I hadn’t even considered PEACE. So here you go – a companion set. Not all the same fonts, because certain fonts work best with certain words. I discovered a lot of new stuff working on these templates. The first is the counting. While the method I originally mentioned worked really well for simple shapes and words where there were small, very distinct areas where counting double folds was important, for complex and especially slanted words it was hard. I discovered if you count, and keep track of, every starting point (so the top of every line) you will have a very accurate number for the total sheets/pages you need. 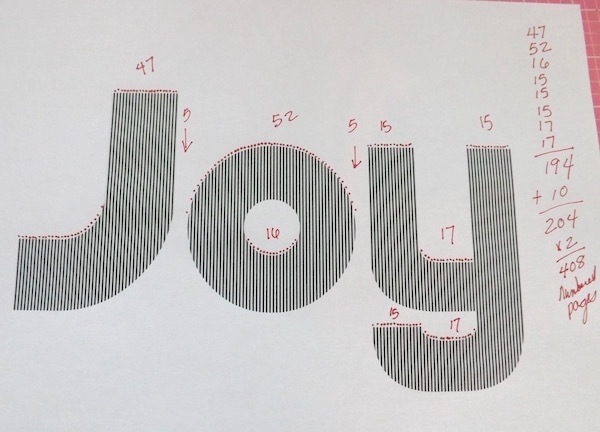 As this font needs spaces between the letters, I’ve added 5 pages between the J and O and the O and Y. I would just fold those back so there is nothing showing at the edge. Another thing I learned is that I have very little accurate recollection of the fonts I use, when I do big groups. They all seem to muddle up in my head. One good thing about upgrading to el Capitan from Snow Leopard is some added tools in Preview. So this snapshot of all the options has the font names listed too. Nice, eh? And the multipage PDF is here. Have fun with them, and if you do, say a thank you to Ashley!